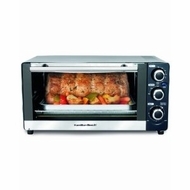 "HAMILTON BEACH BRANDS" 6 SLICE TOASTER OVEN BROILER Second oven convenience. Saves time & energy - reheats 28% faster and uses 65% less energy. Fits a 12 inch pizza. Timer with auto shutoff. Slide-out crumb tray. Nonstick interior. Bakes, broils & toasts. Bake pan & broil grid included. Saves time & energy - reheats 28% faster and uses 65% less energy. Fits a 12 inch pizza.